These are the last of the licensed Made in USA Dazzle shorts with a Chuck Taylor logos, elastic band, drawstring, and side pockets made by the A4 (Authentic American Athletic Apparel) division of the Moshay Corporation in Vernon, California. These lightweight athletic shorts are great for volleyball, basketball or casual wear. There are only a few left. You can order these shorts at The ChucksConnection online store. 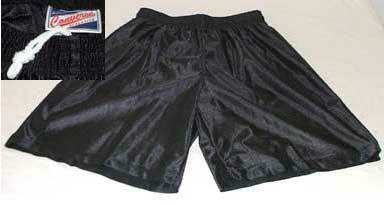 These shorts come in black, silver, and navy blue. 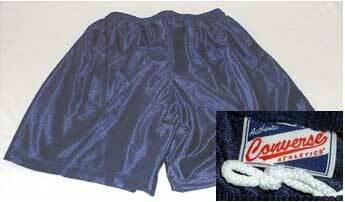 A 9 inch long short with an elastic waist, drawstring and a bright satin-looking finish. 100% polyester. Inset shows drawstring and inside label. 300 Models of Shorts. Shop 100 Converse Products. Over 4500 Models of Shorts. Shop 398 Converse Products. From Head To Toe - Shop Casual at Eastbay.com! For shorts selections, for men, women, or kids, click on the Eastbay link to the left. Under Shop By Department, select Clothing then Shorts. This will get you access to dozens of shorts choices by style, brand, gender/age, sport, league, new arrivals, price, color, or product rating. 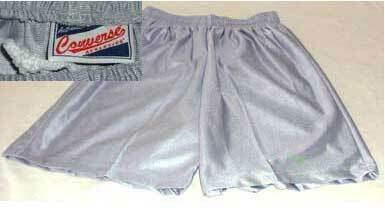 Get Converse shorts at KicksUSA. Converse Fleece Shorts for Men with the Chuck Taylor Logo from Kicks USA. Click on the link above and then type Mens Converse in the white search box.